We’re several days past April Fool’s and still the kooky weather. Today brought us the gamut: drizzle in the morning, rain at lunch time and then this afternoon we ran to the windows to watch hail hammer off the pavement. As hailstorms around here go it was a long one. Twenty minutes or so. And after it let up the ground was white, as if it had snowed. Then the sun came out. Now we have puffy white nimbi floating over in a bright blue sky. With the copious precipitation this year, concern for slopes and bluffs remains high. Our own bluff has done it’s annual slough. All we can do is hope that having left the vegetation on the upper crest, we’ve done what we can to protect it. Unfortunately the garden maintenance crew that the neighbors hire is overly fastidious. Each week, year round, they remove every downed leaf, every scintilla of vegetation, leaving behind only scalped dirt with no humus. I like to call this gardening style landscraping. Of course, the stormwater runs swiftly off, aimed directly at the south corner of our bluff. That’s where the sloughing always starts, then it peels northward. My gentle hints about leaving some vegetation led them to plant a dozen salal shoots. It’s going to be a while until those are of much help in slowing the runoff. Meanwhile the humus continues to drive away in the back of a pick-up every week, to become topsoil in some other place. This kind of misunderstanding about care of the land is what keeps my bluff expert friend Elliott busy all day and up all night. If I have night worries about sliding slopes, I’m sure they pale in comparison to Elliott’s. He tirelessly tries all kinds of approaches to get the word out about bluffs, hydrology and the importance of native vegetation. Here’s the latest, a charming story about how stormwater works in the landscape written by another of Elliott’s friends. The story is in PDF, to read it, just click the title image or that strategic chunk of anchor text above. 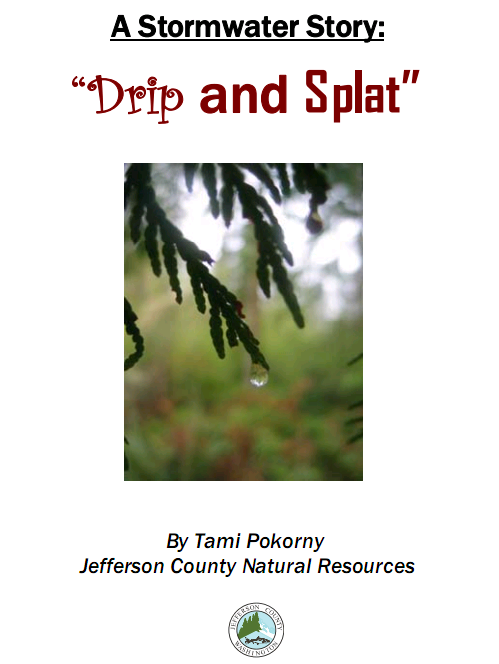 Thanks Tami and Jefferson County Natural Resources for sharing, and to Elliott for passing it on.